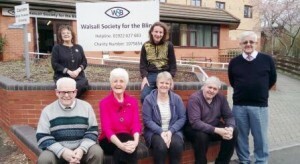 Walsall Talking Newspaper is an audio production for those with sight loss in the Walsall Borough. In Touch magazine – from Radio 4, a programme for visually impaired listeners, with the Brilliant Peter White. We always love to hear from our listeners through letters and feedback, adapting to their suggestions and requests, striving to be the best we can be and the production our listeners want. Both publications are supplied on USB memory sticks, they can be played on USB players, through a computer and specially adapted audio equipment. You can find WTN and Walsall Society for the Blind on facebook and twitter and you can listen to our weekly podcast through SoundCloud. 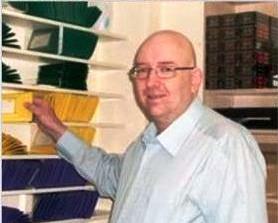 Each week our team of dedicated volunteers research and compile the news and articles, record, copy, pouch and despatch. The production is then sent out to our listeners on a memory stick, to listen to in the comfort of their own home. 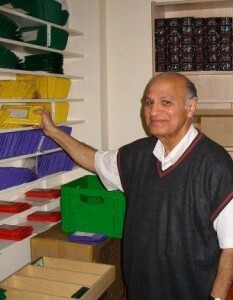 They are sent in a zip up pouch, under the Royal Mail’s free postage service, ARTICLES FOR THE BLIND. Once listened to, enclose the stick back inside the pouch, turn over the address label on the pouch and post if back to us. YOU DO NOT NEED TO ADD POSTAGE. Providing we receive the memory stick back, the next one will be sent out the following week. 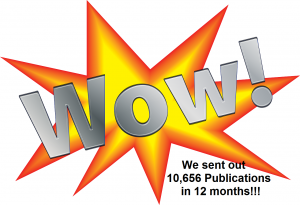 If you would like to receive WTN and Magazines, all you need to do is to get in touch with us and we will do the rest. You can call us on 01922 627683, you can email us at wtn@wsftb.co.uk, you can message us via facebook, or you can pop in to meet us at Walsall Society for the Blind. Walsall Talking Newspaper and Magazine are free services, come and join the ever growing WTN family, we are here for you. Would you like to Volunteer for Walsall Talking Newspaper? Are you interested in news, current events and enjoy reading through the newspapers? Would you have time to spare, to volunteer each week, to choose material for our audio Walsall Talking Newspaper? If so, then you are exactly who WTN are looking for, as we are seeking volunteer researchers, for our weekly production. Enjoy tea/coffee/biscuits, all newspapers are supplied. information, please contact Keith or Jayne on 01922 627683. Walsall Talking Newspaper Engineer Barry attended the #TalkingNewsFederationConference 5th – 7th October with WSB CEO Amanda Reed, who is also the Chairman of the Talking News Federation. Picking up advice and information from workshops and catching up with everything TNF and friends old and new. 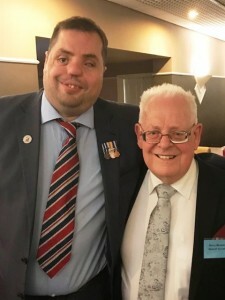 Barry was very proud to meet and speak with Simon Brown of Blind Veterans, who was the inspirational guest speaker at the conference. Wishing our very dear friend all the very best for the future as she leaves WTN. 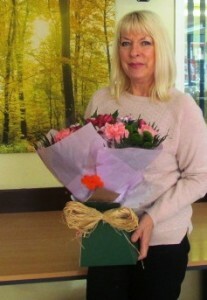 An amazing volunteer and a wonderful lady, who over the past 5 years has dedicated her time, hard work and commitment to others. 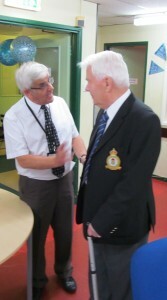 Lots of love from your friends at Walsall Talking News, Walsall Society for the Blind and your listeners. 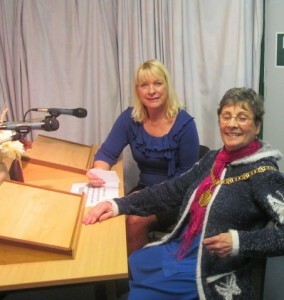 We were thrilled to welcome the Mayor of Walsall Kath Phillips and Consort to the Walsall Talking Newspaper Studio on Wednesday 25th January 2017. The Mayor came to the studio to be interviewed and recorded for WTN, to give us a little insight as to what being the Mayor of Walsall encompasses. 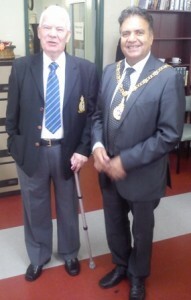 The Mayor also spent time chatting to our Wednesday Group Social Activity Centre clients and we would like to say thank you for spending time with us today and that the Mayor will always be welcome as part of the Society. 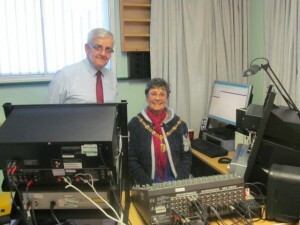 There are 2 pictures with this post, 1 shows the Mayor with WTN Volunteer Jane, who prepared and conducted the interview and picture 2 shows the Mayor sitting in front of the recording decks with Talking Services Manager Keith Corbett. We hope you are a listener of our Talking News, if not, why not contact us to learn more, come along and join the WTN family. 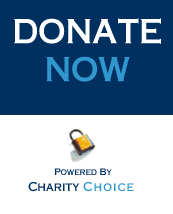 If you would like to hear a sample of our weekly newspaper, please scroll down the page to the audio links. Saturday 24th August 2013 was the day chosen for WTN’s 30th Birthday. 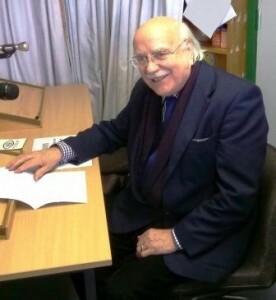 We were delighted that over 90 WTN listeners plus their families, friends or carers came to join us, along with the Worshipful Mayor of Walsall, Mohammed Nazir, local author Brian Stringer and founder of WTN all those years ago Joe Meason. The event was covered by Walsall Express and Star and Midlands Today and we would like to thank everyone for their good wishes and support. Heres to the next 30 years!!! !